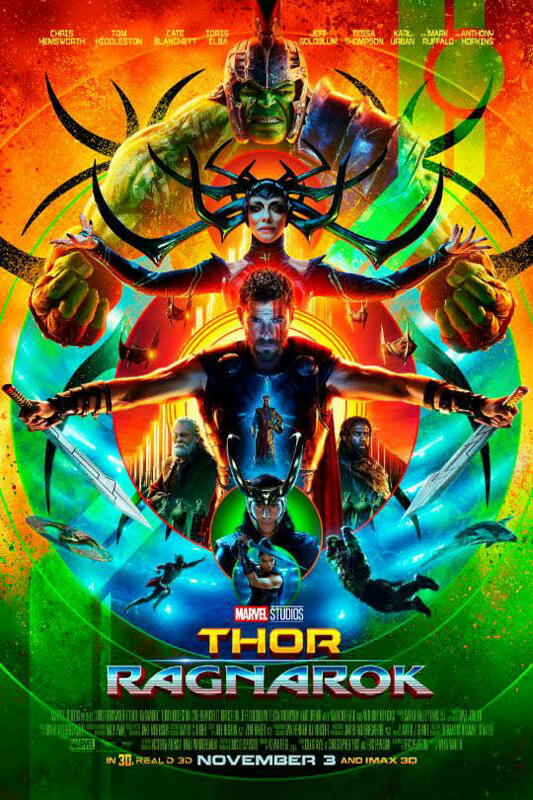 The Norse God Thor (Chris Hemsworth) goes on the hunt to find his missing father Odin (Anthony Hopkins), only to meet an evil sister he never knew he had (Cate Blanchett), get thrown halfway across the universe to a junk planet ruled by an eccentric immortal (Jeff Goldblum), and be forced into the arena to fight that immortal’s undefeated champion: the Incredible Hulk (Mark Ruffalo). From there he must fight to return to Asgard before Hela (Blanchett) destroys his entire home and everybody on it. That roughly describes the plot of Thor: Ragnarok, Marvel Studios’ third feature film following the titular Norse God, but what it does not remotely suggest is the film’s tone. Abandoning the heightened gravitas and epic overtones of the franchise’s two previous films, Ragnarok goes all-out for comedy. In the hands of director Taika Waititi (What We Do in the Shadows, Hunt for the Wilderpeople) it charts a completely new creative course for Marvel. There is not a scene that is not dominated by jokes. There’s not a serious or impactful moment that is not immediately punctured by a gag. Now whether this is a good thing or a bad thing is entirely down to the taste of the viewer, and that makes it a very difficult film to review. Certainly it has been remarkably popular, grossing considerably more in theatres than either of its predecessors. On a personal level I came to Ragnarok having adored the original Thor and broadly liked – with caveats – its sequel The Dark World. That actually made Ragnarok a relatively tedious and unwanted experience. It feels like an odd reaction, given how overwhelmingly positive the general critical response to the film was been. It also feels odd because if, 10 years ago, someone had told me that by 2017 there would be a big-budget effects-driven film featuring Thor and the Hulk in a loose adaptation of the comic book storyline “Planet Hulk”, starring Cate Blanchett as the villain and Jeff Goldblum in a key supporting role, and that there would be a supporting appearance by Doctor Strange, I would have anticipated that film as much as my eight year-old self anticipated Return of the Jedi. Sadly, jokes ruin everything. Thor: Ragnarok is a great film and a terrible film. It’s great because it demonstrates that Marvel Studios are not entirely enslaved to simple narrative and genre models, and that simply because two films in a series are made in a particular style it does not automatically demand that the third should follow suit. It’s terrible because, for all of its gags, jokes and comedic set pieces, the meat of Ragnarok hangs off a very shaky and poorly developed skeleton. The story is about Thor and Loki’s previously unknown sister Hela returning to Asgard and threatening to lay waste to the mythical Nine Realms, but it is also a story about Thor and the Hulk getting trapped on an alien planet dominated by a vast arena where they are charged with fighting one another to the death. They are not easily linked narratives, and time spent showcasing one draws valuable time and story space away from the other. Better for Waititi and Marvel to pick one and focus on it. Given the tone, that would be the “Planet Hulk” riff; without sufficient gravitas and a constant attempt to undercut drama with humour, the entire Asgard section of the film falls terribly flat. Key characters in the previous two films die in Ragnarok but Waititi leaves no time for the audience to even react, let alone form an actual emotional response. For any viewer who disliked or failed to engage with the original Thor, this likely is not an issue. For anyone who loved the original or its sequel, it feels a bit like a gentle slap to the face. Matters are not helped by the performances of either Blanchett or Karl Urban, which feel unenthused and rote throughout. Back on the junk planet of Sakaar, the film does much better. This is in part because these scenes are dominated by new characters that can be comedic on their own terms. Jeff Goldblum’s laconic and all-powerful Grandmaster is a predictable joy, while a developed and more verbose version of the Hulk gives Mark Ruffalo the best material he’s yet had in a Marvel film. Chris Hemsworth continues to demonstrate a real gift for comedy. Tessa Thompson (Creed) struggles to maintain an English accent as new heroine Valkyrie. The rock-like alien Korg vastly overstays his welcome as a one-note joke that probably was not that funny to begin with. Many jokes do work, and some work sensationally. A film that cut about 80 per cent of them would have allowed the best 20 per cent to absolutely sing. The film over-uses computer-generated effects, giving everything a somewhat artificial sheen. It is most obvious in scenes where the use of CGI simply makes no sense. A key dramatic sequence is undercut by the actors being visibly super-imposed onto a Norwegian clifftop. Hela’s clothes and helmet are the most egregiously fake bit of digital costuming since Ryan Reynolds in Green Lantern. When the visual images excel are when they are undertaken with a bit more gravity and care. An early scene involving Thor fighting a fire giant momentarily looks like the painted cover to a classic heavy metal record. When combined with Led Zeppelin’s “Immigrant Song” it forms a truly iconic moment. When the song is re-used during the climax it just feels like a film running out of ideas. The potential for a good film is visible in Ragnarok. Arguably you can see the potential for two. The gulf between what was possible and what actually made it to screen is palpable. I write this aware that I am among the minority of opinions, but in all honesty I think in this case Ragnarok predominantly consists of smoke and mirrors. It will not age well. It’s a series of jokes. In the long term audiences will need an actual story underneath.